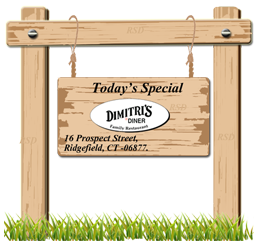 -Delivery Hours : 11:00am to 9:00pm - Order online on our website to get 10% discount by entering promotion code DIMITRIS10. -Delivery Hours : 11:00am to 9:00pm - FIRST TIME USER ON OUR WEBSITE GET 20% DISCOUNT BY ENTERING PROMOTION CODE FIRST20 Spend $ 50 and receive $ 10 off of your order by entering code: 10SPRING in your checkout! . Spend $ 30 and receive $ 5 off of your order by entering code: 5SPRING in your checkout! . Spend $ 20 and receive $ 3 off of your order by entering code: 3SPRING in your checkout! Offer not valid with other specials. Choice of our own Dressing, creamy Italian Red Wine Vinagrette, Russian, Ranch Olive oil Vinegretter. All salads mixed green, Tomatoes, Cuccumbers, Carrots and Onions. Served With Cole Slaw And Pickle.